While some people simply go to the resort website to plan a ski vacation, there are actually a variety of ways to make ski resort reservations. Where do you want to go? : Most of the major resorts have full-service websites, which allow you to book packages that include lifts and lodging. However, some of the smaller, less commercial ski areas have a limited amount of information on their website. 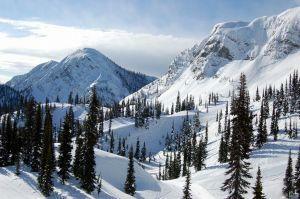 In some cases, these ski areas do not have any type of on-mountain lodging. As such, you will need to arrange for lodging on your own. How do you want to get there? : If you plan to drive, take a plane or a bus to the ski resort, you can use whatever reservation option best suits your purposes. Flying is another story. At certain times of the year, you can get airfare, lift and lodging packages on various airline websites, or on the resort's own page. What amenities do you really need? : This is where things can get tricky. Many resorts offer tempting packages, but do you really need all of the amenities that are offered? For example, Copper Mountain offers a free, Beeline Pass with any lodging package. The Beeline is an express access lift line. The Beeline Pass is valued at over $100. However, if you are visiting the resort during late or early season, lift lines are extremely short. Even though it's supposedly free, the addition of the Beeline Pass is probably making your package more expensive than it should be. Do you want to take lessons? :It's advisable to book your ski or snowboard lesson reservation on the resort website. This is especially important during the holiday seasons, when lessons tend to fill up. If you have kids, pre-booking their ski and snowboard lessons will save you time and aggravation. If ski or snowboard lessons are an important aspect of your trip, consider resorts like Sugarloaf Maine. If you book lodging on their website, you get a free, daily lesson. Do you need to rent ski or snowboard equipment? : Now that the airlines are charging for checked baggage, many people are considering the idea of renting their ski or snowboard equipment. However, the fact many people are doing this implies that it may be hard to find the best gear for your needs. Fortunately, there are a number of ways to make ski gear reservations. While you may be able to do this from the resort website, if you are visiting resorts in Colorado, Utah, Wyoming, Idaho, California or Western Canada, consider RentSkis.com. Their website allows you to enter your gear specifications online. If you visit a different resort and rent from them again, your information is stored in their system.